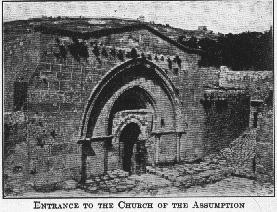 The tomb of the Blessed Virgin is venerated in the Valley of Cedron, near Jerusalem. Modern writers hold, however, that Mary died and was buried at Ephesus. The main points of the question to be taken into consideration are as follows. The apocryphal works of the second to the fourth century are all favourable to the Jerusalem tradition. According to the "Acts of St. John by Prochurus", written (160-70) by Lencius, the Evangelist went to Ephesus accompanied by Prochurus alone and at a very advanced age, i.e. after Mary's death. The two letters "B. Inatii missa S. Joanni", written about 370, show that the Blessed Virgin passed the remainder of her days at Jerusalem. That of Dionysius the Areopagite to the Bishop Titus (363), the "Joannis liber de Dormitione Mariae" (third to fourth century), and the treatise "De transitu B.M. Virginis" (fourth century) place her tomb at Gethsemane. From an historical standpoint these works, although apocryphal, have a real value, reflecting as they do the tradition of the early centuries. At the beginning of the fifth century a pilgrim from Armenia visited "the tomb of the Virgin in the valley of Josaphat", and about 431 the "Breviarius de Hierusalem" mentions in that valley "the basilica of Holy Mary, which contains her sepulchre". Thenceforth pilgrims of various rites repaired thither to venerate the empty tomb of Mary. St. Gregory of Tours, St. Modestus, St. Sophronius, Patriarch of Jerusalem, St. Germanus, Patriarch of Constantinople, St. Andrew, Bishop of Crete, John of Thessalonica, Hippolytus of Thebes, and Venerable Bede teach this same fact and bear witness that this tradition was accepted by all the Churches of East and West. St. John Damascene, preaching on the feast of the Assumption at Gethsemane, recalls that, according to the "Euthymian History", III, xl (written probably by Cyril of Scythopolis in the fifth century), Juvenal, bishop of Jerusalem, sent to Constantinople in 452 at the command of the Emperor Marcian and Pulcheria, his wife, the Shroud of the Blessed Virgin preserved in the church of Gethsemane (P.G., XCVI, 747-51). The relic has since been venerated in that city at the Church of Our Lady of Blachernae. There was never any tradition connecting Mary's death and burial with the city of Ephesus. Not a single writer or pilgrim speaks of her tomb as being there; and in the thirteenth century Perdicas, prothonotary of Ephesus, visited "the glorious tomb of the Virgin at Gethsemane", and describes it in his poem (P.G., CXXXIII, 969). In a letter sent in 431 by the members of the Council of Ephesus to the clergy of Constantinople we read that Nestorius "reached the city of Ephesus where John the Theologian and the Mother of God, the Holy Virgin, were separated from the assembly of the holy Fathers", etc. Tillemont has completed the elliptical phrase by adding arbitrarily, "have their tombs". He is followed by a few writers. According to the meditations of Sister Catherine Emmerich (d. 1824), compiled and published in 1852, the Blessed Virgin died and was buried not at Ephesus but three or four leagues south of the city. She is followed by those who accept her visions or meditations as Divine revelations. However, St. Brigid relates that at the time of her visit to the church of Gethsemane the Blessed Virgin appeared to her and spoke to her of her stay of three days in that place and of her Assumption into Heaven. The revelations of Ven. Maria d'Agreda do not contradict those of Catherine Emmerich. As the soil is considerably raised in the Valley of the Cedron, the ancient Church of the Sepulchre of Mary is completely covered and hidden. A score of steps descend from the road into the court (see Plan: B), at the back of which is a beautiful twelfth century porch (C). It opens on a monumental stairway of forty-eight steps. The twentieth step leads into the Church built in the fifth century, to a great extent cut from the rock. It forms a cross of unequal arms (D). In the centre of the eastern arm, 52 feet long and 20 feet wide is the glorious tomb of the Mother of Christ. It is a little room with a bench hewn from the rocky mass in imitation of the tomb of Christ. This has given it the shape of a cubical edicule, about ten feet in circumference and eight feet high. Until the fourteenth century the little monument was covered with magnificent marble slabs and the walls of the church were covered with frescoes. Since 1187 the tomb has been the property of the Muslim Government which nevertheless authorizes the Christians to officiate in it. MLA citation. Meistermann, Barnabas. "Tomb of the Blessed Virgin Mary." The Catholic Encyclopedia. Vol. 14. New York: Robert Appleton Company, 1912. <http://www.newadvent.org/cathen/14774a.htm>.